Enhance your ensemble with the elegant esteem of the Tissot® PR 100 Lady Small watch. Round 316L stainless steel case with rose gold PVD coating. Three-link stainless steel bracelet with rose gold PVD coating stripe. Three-hand analog display with ETA F03.111 Swiss quartz movement, and date display window. White mother-of-pearl dial face features stick indexes and minute track at perimeter. 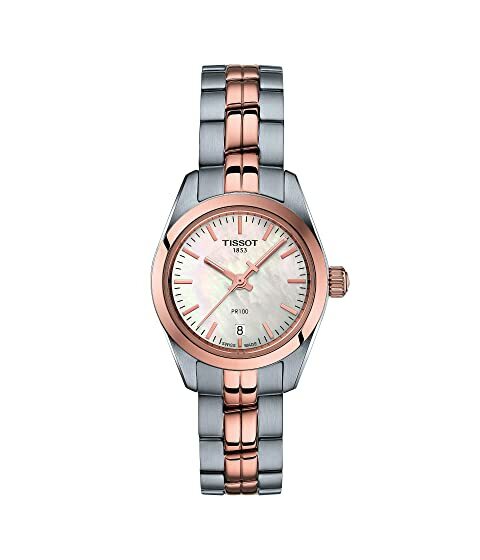 We can't currently find any similar items for the PR 100 Lady Small - T1010102211101 by Tissot. Sorry!